Munchy Munchy was born May 18, 1987. 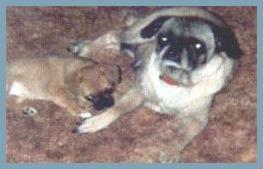 Munchy's mother was a purebred pug, AKC registered. From the beginning, Munchy has proven to be almost exactly like her mother. Smart, Loyal, and protective of her family!! 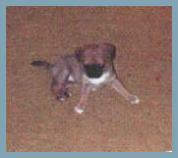 These are pictures of Munchy (6-8 weeks old) with her mother. 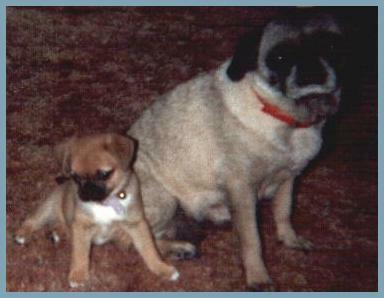 Munchy was the runt of the litter. She was very small and the only girl out of 4 puppies. We wasn't sure if she would even survive. Her brothers were quite large and would push her out at feeding time. My mother decided that Munchy should have a seperate feeding time. After just a short period, she was able to fight her brothers for her feeding spot. The picture on the left is Munchy chewing on stuff she wasn't supposed to be chewing on. 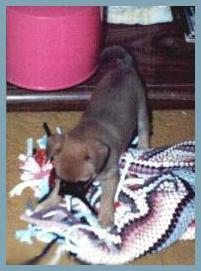 She really loved to chew on everything. There's a list a mile long of things that she destroyed when she was a puppy. But, thankfully, she did grow out of that. The picture on the right is Munchy just being sweet and innocent. She is adorable, Isn't she!?! 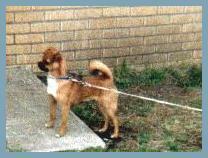 This is Munchy at about 2 years old. She has always been on the lookout for trespassers. Always protecting us. She was always leary of strangers. And she didn't like it when any of us would rough house with our friends. If she thought we were getting too rough she would let us know. 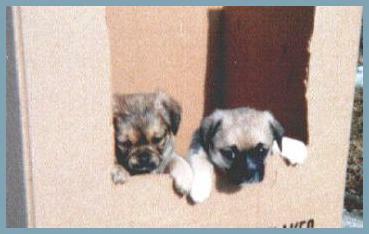 This is a picture of the only litter of puppies Munchy has ever had. There were 3 puppies, but one did not survive. Shortly after this litter we had Munchy spayed. This is Munchy at 12 years. Even at 13 years old, Munchy is still going strong. She has a slight hearing loss and her eye sight isn't as good anymore, but she is still very healthy and very active. On her last trip to the vet, he said that she had a very strong heart for a dog her age. 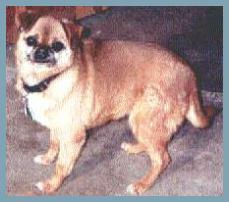 Unfortunately, she has developed a bit of arthritis in her hips and her teeth were shot. She had to have 4 teeth pulled. Since she would never let anyone ever look in her mouth, we had no idea that she had lost about 17 teeth on her own somewhere. So now our poor baby only has 11 teeth left in her mouth. Despite the missing teeth she still eats very well. Teeth or no teeth she has been a wonderful part of our family. Hopefully she will be for many more years!!! Well Munchy is 15 now. She's still with us, but sadly maybe not for long. We took her to the vet the day before her 15th birthday because of a growth that had developed on her hind quarter. Of course, it had to be a tumor. Well the Doc had to determine what kind of tumor so he took an x-ray of Munchy. Prognosis, Not good! She has two other tumors on her heart and her bones are rapidly deteriorating. In fact, in the x-ray you could barely see her ribs. She's losing calcium from her bones which in turn is causing that tumor on her hip to grow. Doc says it's possible that she could live another 3 years, but not likely. He seemed to think a few more months for our poor old girl. We have to watch her closely now. If she breaks a bone or her tumor gets worse she'll have to be put down. It won't be repairable as there is nothing there to repair. It's very sad news. She's been with us since her birth. We've been through tons of things together. It's hard for us to imagine her not being here. It's really heartbreaking!!! Our sweet adorable Munchy has passed to Rainbow Bridge. The tumor got the best of her and she had to be put down. This was the most difficult thing to do. Hopefully she's in a better place now and feeling young and strong again. We miss her so terribly much. She was truly the very best friend ever. She Will Never Be Forgotten!!! Pug snowglobe courtesy of Bonnie! !